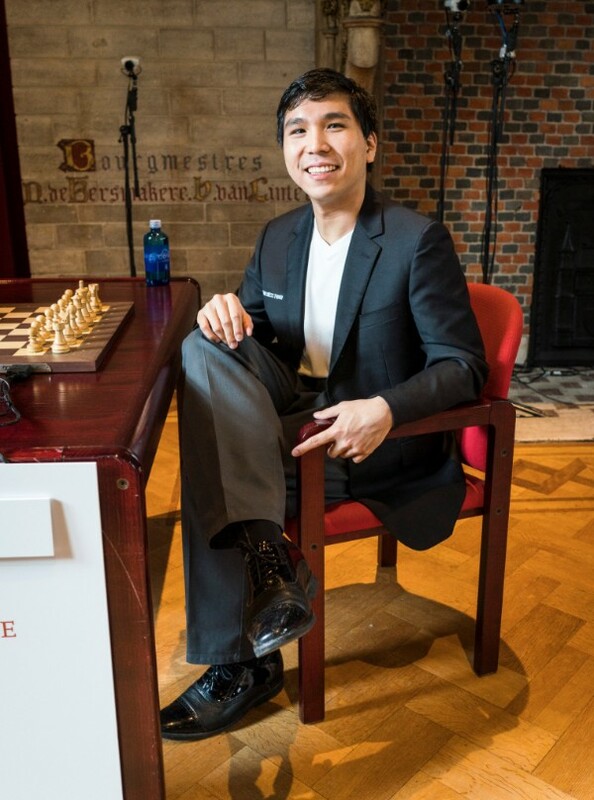 Day two of Your Next Move was all about Wesley So, as the American keeps showing excellent form and has extended his lead to two points. Levon Aronian had a strong showing and is the next closest to the leader. He is one win away from catching So and is a full point ahead of the trio of Karjakin, Mamedyarov and Vachier-Lagrave. 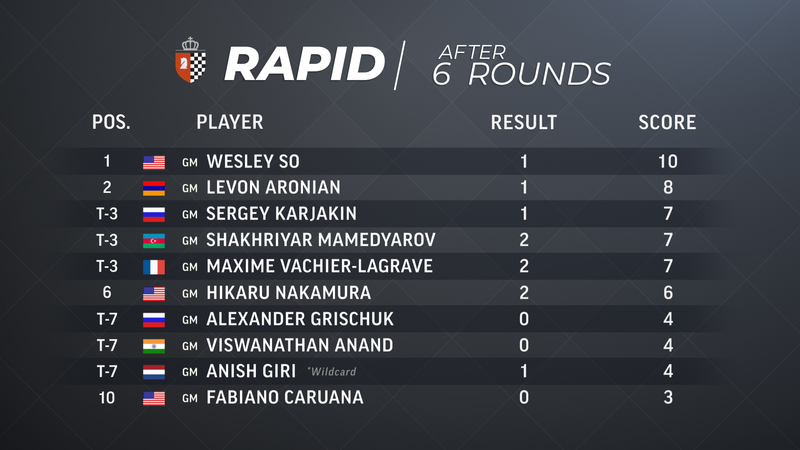 Tomorrow is the final day of the rapid portion and Wesley So is en route to repeat his last year’s result. Wesley So started the day off strong with a tactical sequence that won a pawn against Anish Giri. He went on to convert the material advantage in the endgame without any trouble. 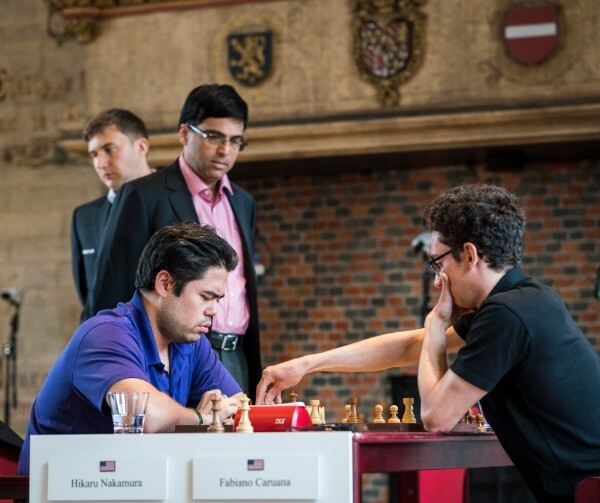 In the all American match up, Fabiano Caruana emerged victorious due to his superior pawn structure as Hikaru Nakamura was unable to find counterplay. Sergey Karjakin and Levon Aronian entered the day a full point behind the leader but failed to keep pace as they drew Viswanathan Anand and Shakriyar Mamedyarov respectively. Maxime Vachier-Lagrave continued his draw streak with another peaceful result against Alexander Grischuk..
Wesley So continued his winning streak with a victory against Grischuk after his king marched to his opponent’s queenside and collected all the pawns. 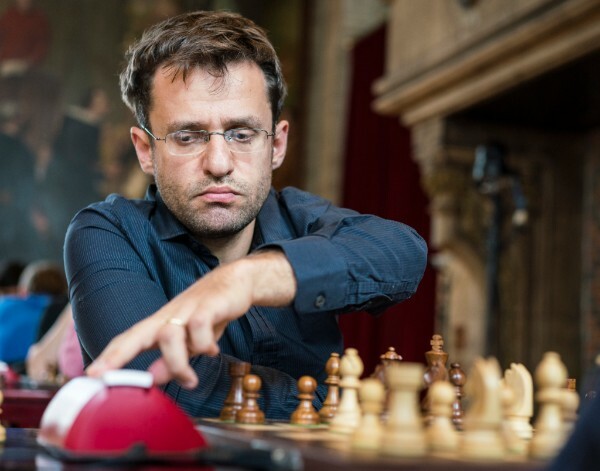 Levon Aronian inched a bit closer to the winner with a win over Anish Giri in an endgame where his queen and two pawns overpowered his opponent’s two rooks. Anand’s knight pair overpowered Caruana’s knight and bishop pair and lead him to victory in an instructive endgame. Karjakin had a miracle save in a completely lost endgame against Mamedyarov when he managed to enter a rook against rook and a bishop endgame. The Russian managed to escape unscathed after his opponent missed many winning chances. Vachier-Lagrave had a very interesting piece sacrifice against Nakamura but settled for a draw with a threefold repetition. The match up of the round was between So and Aronian. The American had no difficulty drawing the game and thus maintaining the two-point lead. Vachier-Lagrave and Mamedyarov moved up in the rankings and are now in a tie for third place with a point behind Aronian after their wins against Anand and Caruana respectively. Karjakin is also tied with the duo for third place after his quick and sound draw against Giri. Nakamura defeated Grischuk in a rook endgame after the Russian made a crucial blunder at the last moment. All information is available on GrandChessTour.org. Live commentary by GM Yasser Seirawan, IM Jovanka Houska, and GM Alejandro Ramirez. As last year, GM Maurice Ashley will be on-site in Leuven to interview players and will be joined by GM Nigel Short. This year, the English broadcast will be joined by a Russian commentary team of GM Evgenij Miroshnichenko and GM Yaroslav Zherebukh. Watch live. Watch the games of the Your Next Move Grand Chess Tour 2018 with computer analysis LIVE on ChessBomb.